When Johnny Miller flew a drone for the first time in February of 2016, he couldn’t have anticipated what it would eventually lead to. Miller, originally from Seattle, moved to Cape Town, South Africa, in 2011 to study anthropology. He got a drone, intending to showcase the beauty of Cape Town. A friend gave Miller the idea to use the drone to highlight the segregation of the area. In an interview with AirVuz News, Miller recalled the first time he saw his city from the sky. 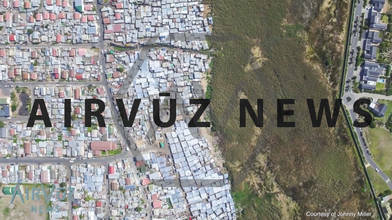 The project has since been named “Unequal Scenes.” The images from the drone -- a DJI Inspire -- showed the stark contrast of neighborhoods segregated during South Africa’s Apartheid, which ended in 1994. On his website, unequalscenes.com, Miller includes a bit of history and description about each picture, but the powerful images truly speak for themselves. While reactions to the photos have mostly been positive, there have been some critics. They ask why Miller singled out Cape Town in particular and South Africa more generally when many other cities throughout the world have similar divisions. Miller said he chose Cape Town to begin the project simply because that’s where he lives. He hopes to do the same thing in other countries. Miller’s images earned him worldwide attention. He’s been invited to speak at Drontech Europe in the United Kingdom next May, and numerous media outlets have reached out for interviews. Miller hopes to use these images to promote positive change in a city and country that is still feeling the effects of Apartheid, more than 20 years later. He hopes showcasing the segregation via drone images can help spark conversation for change. Follow AirVuz News for the latest updates in the drone community!